Fit people, beautiful views. That’s the name of the game at Flagstaff, a ski and college town set along historic Route 66, hovering 7,000 feet above sea level. 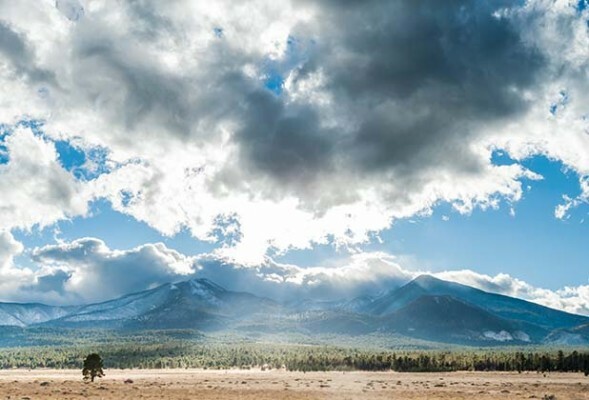 Flagstaff is often called the City of Seven Wonders for its proximity to destinations including the San Francisco Peaks and the Grand Canyon, about 80 miles north. And it’s the kind of place where high-altitude runners, skiers, cyclists, and hikers settle down — many after graduating from Northern Arizona University. In other words, it’s the perfect spot for one active weekend. Don’t come to Flagstaff if you plan to sit around. Start off by running the two-mile loop around Buffalo Park. That should be a good warm-up to hit the slopes at the Arizona Snowbowl. Here for the summer sun? Play a round of disc golf at Snowbowl’s scenic pine-laden 18-hole course, hit the Schultz Creek Trail single track to log some miles on your mountain bike, or go rock climbing at West Elden or The Pit. The 100-year-old national monument of Walnut Canyon is a must-hike, thanks to the ancient cliff dwellings and bygone pueblo communities. And you can always head to the Grand Canyon. After the day’s activities, prepare for some hops. This is a beer town. Start at Hops on Birch with 28 rotating taps and live music all weekend; Mother Road Brewing Company for the ever-changing beers like oak-barrel-aged anniversary English barleywine and the Tower Station American IPA; or Beaver Street Brewery for their award-winning red ale or seasonal hefeweizen. Then check out live music at either the historic Orpheum Theater downtown or drive out to the iconic, taxidermy-covered log cabin that is now the Museum Club out on Route 66. High-calorie fare for hikers, bikers, runners, and skiers is the culinary skew for the town. Good thing you’ve earned it. Grab lunch or weekend brunch at the Latin-meets-Southwest inspired Criollo Latin Kitchen. Then menu highlights ingredients sourced from Northern Arizona and the Four Corners region in not-to-miss dishes like huevos carnitas with citrus-infused pulled pork and poached eggs; blue corn pancakes with blueberry compote; and a variety of tacos ranging from adobo-marinated carne asada to Mexican white shrimp. Don’t miss their weekday happy hour for $3.50 margaritas, $2 Tecates, and a host of cheap yet tasty snacks. Pizzicletta offers wood-fired pizzas topped with organic produce and humanely raised meats blazed in a 900-degree oven made in Naples, Italy. Get a red-sauce margherita with hand-pulled mozzarella and basil or the white amore oi mari pizza with mascarpone, pecorino, prosciutto, and arugula. Stick around for scratch-made house gelato. Want something a little more upscale? The menu at Chef Tony Cosentino’s Josephine’s Modern American Bistro, set inside an historic home dating back to 1911, ranges from Southwestern crab cakes with sesame-crusted quinoa masa cake and a spicy remoulade to bacon-wrapped Arizona filet mignon in a red wine demi glace topped with sautéed truffle-scented crimini mushrooms. The historic Hotel Monte Vista, with 73 Southwest-styled rooms, is rumored to be haunted by a number of intriguing characters, and has hosted celebs over the years like John Wayne, Freddy Mercury, Humphrey Bogart, and Debbie Reynolds. Grab a drink at its cocktail lounge with a seasonal menu and housemade bitters while you play free billiards and darts to live music and karaoke. Or get outside the city to the quiet comforts of the Little America Hotel. Set among 500 acres of Ponderosa Pine with hiking trails, the hotel with well-appointed oversized rooms (the main lodge is currently undergoing a renovation) offers a perfect set-off point for a plethora of outdoor activities at the numerous nearby state and national parks. Note: During the holidays, the hotel hosts the North Pole Experience, an indoor-outdoor festive recreation of Santa’s workshop and families abound. Whether you’re looking to take away or sit and make new friends, the Pay ‘n Take Downtown Market melds a convenience store for things from breakfast burritos to socks for hikes and a café and bar with craft beer on tap where all drafts are $3 for happy hour between 4 p.m. and 7 p.m. daily. Or grab handcrafted sandwiches at Proper Meats + Provisions butcher shop to take on your hikes. For an alternative stay, think about renting a yurt for camping at the Flagstaff Nordic Center inside the Coconino National Forest and get in the middle of all the hiking, biking, and cross-country skiing and snowshoeing.